New York City Mayor Bill de Blasio announced a major expansion to the NYC Carbon Challenge, a partnership between the city’s public and private sectors aimed at reducing greenhouse gas emissions through building modernization. In In early February, the NYC Carbon Challenge expanded to include additional commercial tenants as well as building owners, adding another 58 million square feet of building space to the overall efforts to make the city more energy efficient. The challenge motivates owners and tenants to find “unique and creative solutions that enable greater energy efficiency and sustainability improvements.” One of the first participants to meet the program’s 30% GHG reduction goal was Google, which cut its total energy use by 36.5% by: 1) replacing old, inefficient steam chillers with new electric chillers; and 2) upgrading 3,338 existing windows to triple pane, argon-filled, low-e, thermally broken windows. While improving the energy efficiency of a building often requires a multi-pronged approach, including upgrades to HVAC and lighting systems, one of the most significant sources of energy loss in a building is almost always its windows. A 2011 Department of Energy presentation entitled “Window and Envelope Solutions for Today and Tomorrow” concluded that 58% of a building’s energy is impacted by its windows, accounting for almost 14% of the total energy consumption in the U.S.
Of course, replacing every window in a commercial building is a costly upgrade, and one that likely wouldn’t yield a ROI for many years despite the significant savings in energy costs. Fortunately, traditional replacement windows are not the only option when it comes to addressing a building’s window system. Thermolite interior retrofit windows provide commercial building owners with a cost-effective way to upgrade a building’s entire window system without having to replace a single pane of glass. Unlike traditional replacement windows, Thermolite interior retrofit windows are installed on the inside of a building’s existing glass. There’s no need to tear out the original window pane, which eliminates the need for costly high-rise labor. Additionally, Thermolite retrofit windows can be installed during evening hours, eliminating any office downtime. Thermolite’s window retrofit system also provide greater energy savings than traditional replacement windows, as the newly created air gap between the existing window and the retrofit window provides an additional layer of insulation that further inhibits the transfer of heat. A 2014 baseline utili¬ty report from the General Services Administration concluded that Thermolite’s retrofit window system will reduce annual energy use at the Sidney Yates Building in Washington, D.C. by at least 23% — without any additional energy efficiency upgrades such as HVAC or lighting improvements. 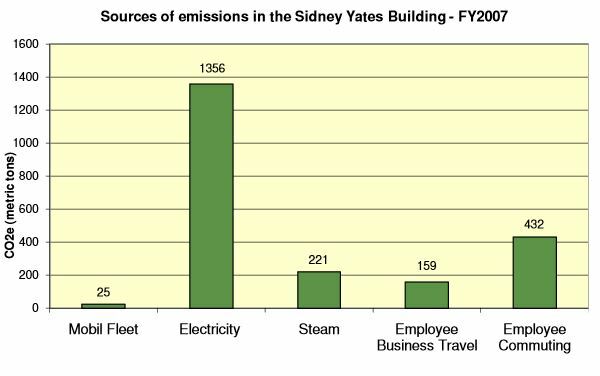 Thermolite’s retrofit window system will also reduce GHG emissions at the Yates building by 12% (8% reduction in electricity and 35% reduction in steam). In NYC, commercial buildings account for roughly 30% of the total emissions. The Carbon Challenge seeks to reduce these emissions by 80% by 2050. In order to reach this ambitious goal, owners will need to examine their building’s particular weaknesses and identify the most cost-effective solutions that will yield the best energy results. Due to the high rate of energy loss through windows, particularly in older buildings, many will have no choice but to upgrade their building’s window system. For these building owners, interior retrofit windows will prove to be a perfect solution. In some cases, they may help owners reach the 30% GHG reduction goal without doing anything else. Thermolite’s retrofit window system is also available for curtain wall windows, and features additional upgrade options including blast protection, storm protection, and hurricane protection. Contact us today to learn more about Thermolite’s many interior retrofit window systems.